June 2012 – The Chillerspot. I spent half of my day watching DVDs that scared the hell out of me, appreciated life and inspired by those cheesy love stories. 06/18 – Day 208: Happy Monday! Tuna sandwich + fries and brewed coffee = Happy Monday! I really love how Nicholas Sparks write love stories. The Lucky One is a story of a soldier named Logan who found a picture in Iraq that brought luck in his life. When he got back in Colorado, he decided to find the girl in the picture and walked miles and miles to Hampton, there he found the girl who made his heart beat. The story was so detailed as expectedly when you are reading it rather than watching it. I finished my e-book and decided to watch the movie weeks after to compare. I was a bit disappointed though. Victor was not part of the movie. He is Logan’s friend who actually pushed him to find Beth. I also expected that Ben hates well not really hate but just don’t like being with Keith but then in the movie they were actually doing well. I don’t really expect that it will be the same as the book but there were scenes that were cut which I really want to see in the movie. Anyways, I am glad that I was able to watch and compare it. What life has to offer me? 06/14 – Day 204: When in doubt… just do it! There are days that I am scared of doing something because I am not actually prepared or just plainly in doubt. I usually doubt myself if I can pull it off well or if I am really capable of doing things assigned to me and then images of myself being screwed up are actually running in my head. I am now in the state of panic. All I need is to shut those mental images and believe… just believe in my own prowess. 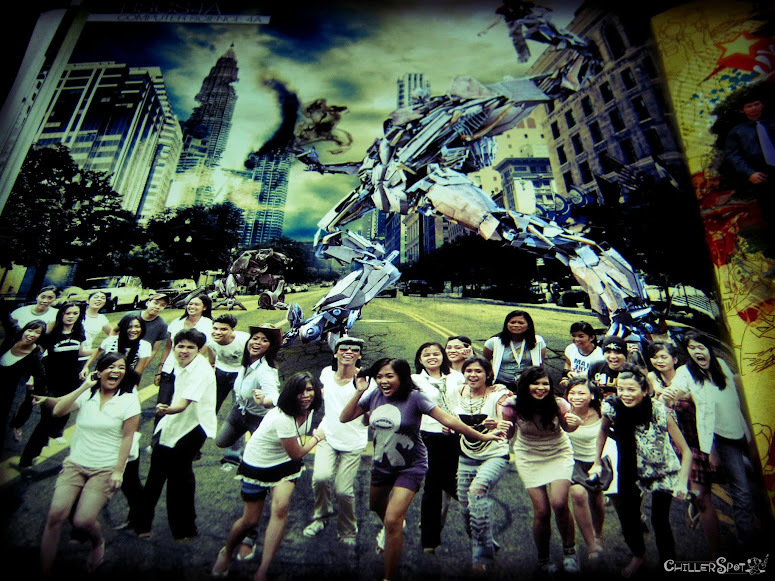 It’s our class picture in our yearbook… and yes the inspiration was so evident – Transformers! I spent an hour recalling great memories I have in college and of course being with my original classmates since first year. Only few were left from our original section when we reached our senior year but of course we welcomed our new classmates wholeheartedly. The quizzes, long test, term exams, exemptions, projects and everyday banters plus laugh trips made me miss college so much. I am not a perfect student… I skipped classes just to play left for dead on my senior year. I don’t listen if I don’t like the teacher or if it’s a terrible math subject. Yes, terrible — like Integral Calculus. It was a subject that I can say is one of the worst subject in my entire school existence that I have encountered. I never learned anything but I must say, I adored my teacher for his intelligence. He was really smart, I just don’t have time to absorb all those limits, derivations and those crazy drawings of x-axis and y-axis on the blackboard. I may be a bit slow in math but then I am proud that I never had a failing grade and I was not given a chance to repeat any subjects. Computer Science was actually tough. Oh God, I spent nights coding my project just to make sure it will run. There are times wherein I succeed and times that I fail but of course there are times also that you need to ask for help to your classmates (It’s not cheating, we used to call it collaborative effort. ;)). Most of the memories I can vividly recall was actually my days with the college yearbook and Red Cross Youth – one of the best club I joined in college. I was part of it during my first days in the university until the day I graduated. Every experience I had back then was actually worthwhile. I spent half of my day playing this addictive game I downloaded in Google Play. I swear you will enjoy it!